Austrian medicinal plants have developed protective oils and resins in response to the arid climate and frequent bush fires that are important in aromatherapy and herbal applications. The most important of these is eucalyptus gum and (Melaleuca alternifolia)tea tree. Santalum spicatum, the source of Australian sandalwood oil is also used in aromatherapy as an ecological alternative to the endangered Santalum album. Aboriginal uses of native plants was poorly documented, and much of the oral traditions of the Maoris are now lost to us. 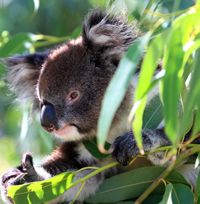 The use of kino, eucalyptus to control infections and bleeding was passed on to early settlers. Leptospermum scoparium, manuka was also a widespread native remedy, including gunshot wounds. Herbal remedies were administered by the Tohanga, both doctor and spiritual healer who used ritual baths as an integral part of the healing process.